you are a member of. you have been invited to. If your site administrator allowed you to create groups yourself, you see the Create group button. 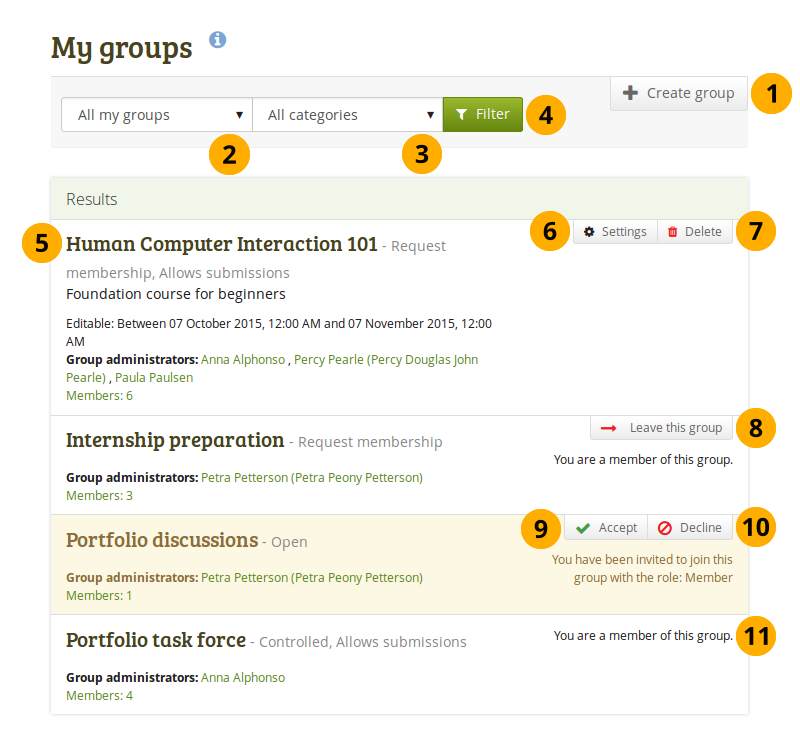 Click the Create group button when you want to set up a new group. You only see this button if the site administrator allows you to create groups. If group categories exist, you can narrow down your results even more. Click the Filter button to see the results. All the groups that you have access to are listed with group title, administrator, description, group type and number of members if the administrator discloses this. Click the Settings button when you want to update the details for a group in which you are the administrator. Click the Delete button only when you want to delete your group permanently. Group members receive a notification that the group has been deleted. When you delete a group, all its content and contributions from users are deleted permanently and cannot be retrieved again. If you are a member of any other group but controlled membership, you can leave it at any time. Click the Accept button to join a group to which you have been invited. Click the Decline button to decline membership in a group to which you have been invited. If you are a member of a controlled membership group, you cannot leave the group. You will need to ask the group administrator to remove you. The Mahara manual is licensed under your choice of Creative Commons Attribution-ShareAlike 3.0 unported or GNU General Public License version 3 or later 2011-2019 Catalyst IT and others. Last updated on Feb 20, 2019. Created using Sphinx 1.8.1.